With Passover coming early, I thought I would try out a few recipes in advance. This one is not so much a recipe as an idea. It was inspired by a several pretty creations I saw on the Internet. 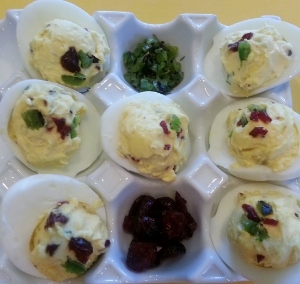 Make any Passover friendly recipe for deviled eggs (I added a bit of horseradish to mine) and then arrange them with green onions, watercress, dill, and radishes to form flowers and buds. 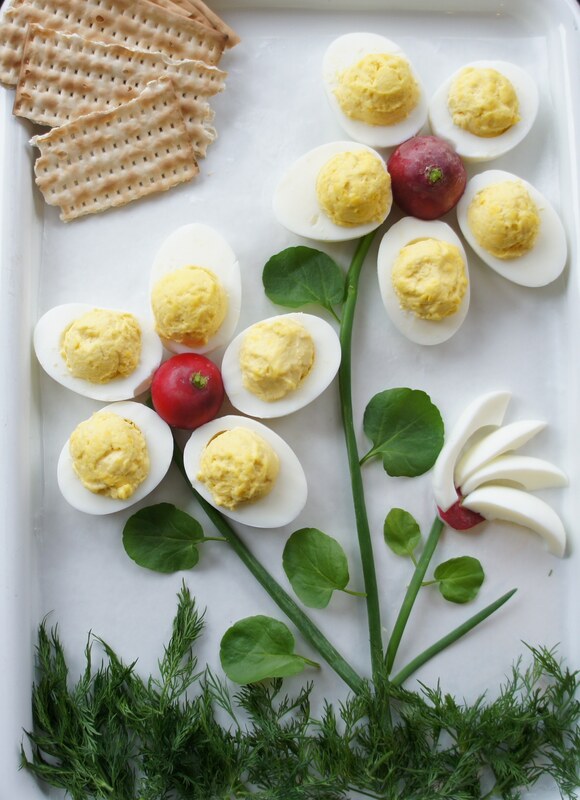 What a lovely dish this would make for a Passover (or Easter) brunch! Although my family celebrates Chanukkah, every year at this time my kitchen is filled with joy and piles of Christmas delights. I bake holiday cookies and make candy for friends and business associates and always make some kind of crazy cake creation for Christmas dinner. I will be posting more about my cake next week, but for today it is all about sweet ways to spread some holiday cheer. This year’s treats included apple cider and walnut brittle, cranberry and pepita caramel, breakfast bark (dark chocolate with raisin bran cereal, ground coffee, and drizzled white chocolate”milk”), peanut butter bark, chocolate treat cups, candy cane & cocoa swirl cookies, chocolate M&M trees, and my favorite, bacon & coffee piglets. 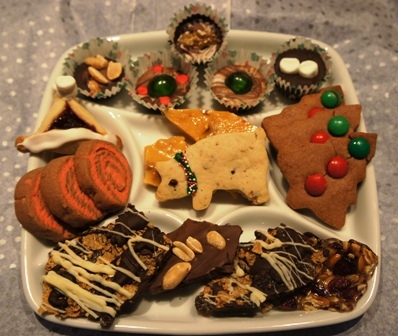 The recipe for these adorable cookies is below and they are as tasty as they are cute.